The next British war poet we'll talk about wrote very differently from our previous poet, Rupert Brooke. Charles Sorley was born May 19, 1895 to philosopher and professor William Richie Sorley in Aberdeen, Scotland. Sorley attended Marlborough College in Wiltshire, England. There, he found a fondness for cross country running, particularity in the rain. The strict Protestant principals Sorley was raised with would stay with him into college, even volunteering punishment for breaking school rules. Before Sorley would have attended Oxford College on scholarship, he spent time in Germany and attended University of Jena until the war broke out. After British declaration of war, Sorley was detained in Trier, Germany, but later released and instructed to leave Germany. When Sorley arrived in England, he volunteered for the British Army and would be sent to the Western Front. Sorley joined as a lieutenant, but would advance to captain within a month. Staples of Sorley's life will show up as recurring themes in his writing. Like rain in Barbury Camp, To Germany, and The Song of the Ungirt Runners, or religion in All the Hills and Vales Along and Expectans Expectavi. In contrast to poets like Brooke, Sorley's tone is noticeably less nationalistic. In To Germany and Such, Such is Death, Sorley writes German soldiers as equals in death and tragedy. Sorley's depictions of death are less idealistic than Brooke's, calling death a "empty pail" compared to Brooke's "richer dust." Sorley describes conflict as futile in To Germany, writing Britain and Germany blindly fighting, and in Such, Such is Death as "So poor, so manifestly incomplete." The "bright Promise", a promise similar to Brooke's, in Sorley's poem is "withered long and sped." This pessimism becomes a theme in continuing poems during the war, and in art afterwards. The tone comes from the conflict Sorley and others experienced in the trenches, and perhaps part of why Brooke as a sailor had a vastly different views on the war. Such, such is Death: no triumph: no defeat: Only an empty pail, a slate rubbed clean, A merciful putting away of what has been. And this we know: Death is not Life, effete, Life crushed, the broken pail. We who have seen So marvellous things know well the end not yet. Victor and vanquished are a-one in death: Coward and brave: friend, foe. Ghosts do not say, “Come, what was your record when you drew breath?” But a big blot has hid each yesterday So poor, so manifestly incomplete. And your bright Promise, withered long and sped, Is touched, stirs, rises, opens and grows sweet And blossoms and is you, when you are dead. Sorley was killed in action on October 13, 1915 of a sniper shot to the head during the Battle of Loos. Sorley's last poem, 'When You See Millions of the Mouthless Dead', was found in his bag after his death. Without a known grave at the end of the war, he was commemorated at the Loos Memorial. When you see millions of the mouthless dead Across your dreams in pale battalions go, Say not soft things as other men have said, That you'll remember. For you need not so. Give them not praise. For, deaf, how should they know It is not curses heaped on each gashed head? Nor tears. Their blind eyes see not your tears flow. Nor honour. It is easy to be dead. Say only this, “They are dead.” Then add thereto, “Yet many a better one has died before.” Then, scanning all the o'ercrowded mass, should you Perceive one face that you loved heretofore, It is a spook. None wears the face you knew. Great death has made all his for evermore. 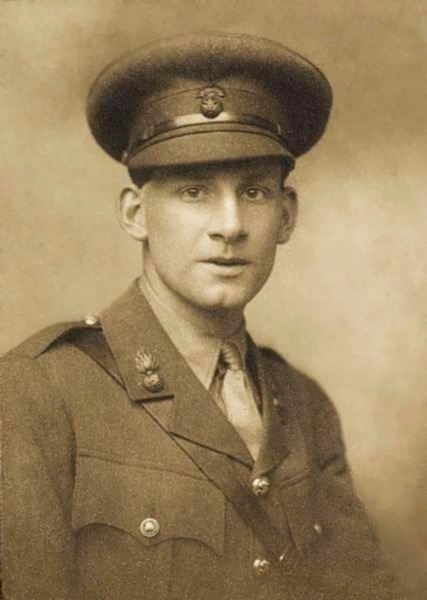 The past posts have covered a number of British poets who served in the Great War and their poetry. Some of their poetry had themes of nationalism and romanticism. Others explored the horrors of war and disenfranchisement with inherited values. Their poetry were documents of their experiences on the Western Front, published to citizens back home, and save for us today. Their poetry was useful in a number of ways. These poems give a view into the trenches of the Great War, for history today or journalism then. Industrialization had changed the landscape of the world, and made the Great War a first of it’s kind. In a changing world without certainty, the horror of the war shocked people and left them without hope. With empty promises of glory and honor, people questioned the values handed down to them from previous generations. The despair and loss of faith in these poems did foreshadow modern art, but the poems inform more than art. Remembrance Day is a memorial of British and Commonwealth soldiers who died in the Great War. Remembrance Day in the United Kingdom is November 11 in accordance with the signing of the armistice in 1918. The remembrance poppy used in commemoration on Remembrance Day is inspired from In Flanders Filed by John McCrae. The poem has visuals of the poppy flowers in the French countryside. The title of Wilfred Owen’s Dulce et Decorum Est references the line Dulce et decorum est pro patria mori from the lyric poem Odes by Roman poet Horace. The line translates to It is sweet and glorious to die for one’s country and know as the Old Lie. The concept of honor and glory in war is centuries old, and contemporary in modern nationalism. As war is still an important part of our world, remembering the costs and experiences of war is meaningful in our handling and attitudes of conflicts. Bent double, like old beggars under sacks, Knock-kneed, coughing like hags, we cursed through sludge, Till on the haunting flares we turned our backs, And towards our distant rest began to trudge. Men marched asleep. Many had lost their boots, But limped on, blood-shod. All went lame; all blind; Drunk with fatigue; deaf even to the hoots Of gas-shells dropping softly behind. Gas! GAS! Quick, boys!—An ecstasy of fumbling Fitting the clumsy helmets just in time, But someone still was yelling out and stumbling And flound’ring like a man in fire or lime.— Dim through the misty panes and thick green light, As under a green sea, I saw him drowning. In all my dreams before my helpless sight, He plunges at me, guttering, choking, drowning. If in some smothering dreams, you too could pace Behind the wagon that we flung him in, And watch the white eyes writhing in his face, His hanging face, like a devil’s sick of sin; If you could hear, at every jolt, the blood Come gargling from the froth-corrupted lungs, Obscene as cancer, bitter as the cud Of vile, incurable sores on innocent tongues,— My friend, you would not tell with such high zest To children ardent for some desperate glory, The old Lie: Dulce et decorum est Pro patria mori. In Flanders fields the poppies blow Between the crosses, row on row, That mark our place; and in the sky The larks, still bravely singing, fly Scarce heard amid the guns below. We are the Dead. Short days ago We lived, felt dawn, saw sunset glow, Loved and were loved, and now we lie, In Flanders fields. Take up our quarrel with the foe: To you from failing hands we throw The torch; be yours to hold it high. If ye break faith with us who die We shall not sleep, though poppies grow In Flanders fields.